Red berries on the Mountain Ash. While driving to a favorite restaurant to celebrate my own glory days — a retirement brunch after thirty-one years in health care — the autumn leaves of the Gatineau Hills glowed gloriously bright.The sun peeked out from behind dark rain clouds, reflecting gold, red and orange. The timing was perfect. Nature too, has its glory days, and surely no season in Ottawa is more spectacular than fall. This burst of color happens when daylight decreases and temperatures drop. Chlorophyll, the green leaf pigment that captures sunlight, is no longer replaced. Underlying pigments are produced — anthocyanins make those glorious reds and oranges, carotenoids create vibrant yellows.Then the spectacle begins. 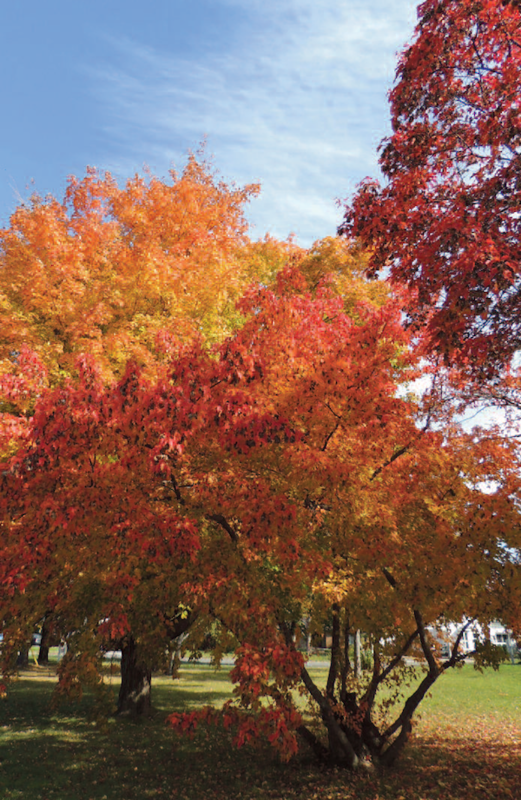 The large-sized Red Sunset red maple (Acer rubrum ‘Franksred’) is a dramatic addition to any yard. It is one of the best trees for fall color. Take care though not to plant it too close to the house where its expansive roots can enter into and expand any existing cracks in the foundation. A smaller tree, well suited to the suburbs, is the tree form of the Burning Bush (Euonymus alatus ‘tree form’). This grafted tree slowly grows to about 10 feet in height with a five foot spread. Its leaves turn a cherry red in fall. The Red Dragon Japanese Maple (Acer palmatum ‘Red Dragon’) is another accent tree and is another slow grower.The fine, delicate textured leaves turn brick red in fall.Again,it grows to about 10 feet tall. It is intended for warmer climes (zone 6b) and therefore will need thick mulch around its root base to protect it in winter and should be planted in a sheltered location. A small multi-stemmed deciduous shrub, the Ruby Carousel Japanese Barberry (Berberis thunbergii ‘Bailone’), has burgundy foliage that turns a brilliant red in fall.With its small size (three feet in height and spread) and its drought tolerance, it does well on small lots and in densely developed inner-city environments. Grasses are also at their peak in fall. The showy Autumn Red Maiden Grass (Miscanthus sinensis ‘Autumn Red’) has foliage that turns to deep red in autumn. Its showy plumes and silver seed heads grow three to four feet in height.This is another plant that does well in an urban environment. Vines can spread and put on a show in fall too.The tough, hardy and fast growing Virginia Creeper (Parthenocissus quinque folia) has large, five-lobed leaves that turn fiery red.Its small black berries will attract the birds. Take care, in the right conditions though, it can be invasive. Ottawa maple trees in their glory. The multi-stemmed Amur Maple (Acer ginnala) has lobed leaves that often turn an outstanding orange, scarlet or burgundy in fall. It is a mid- sized tree, growing 20 feet high, that does well in an urban environment. It is a stunning tree requiring low maintenance. 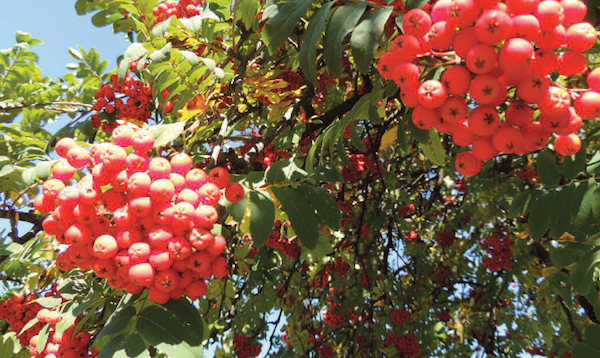 The Cardinal Royal Mountain Ash (Sorbus aucuparia ‘Michred’) is a deciduous tree with dense red berries in fall and rusty orange colored leaves. It is a vigorous grower that is popular with birds and mammals. A high accent shrub, Dart’s Gold Ninebark (Physocarpus opulifolium ‘Dart’s Gold’) has serrated lobed foliage that emerges gold in spring and turns a stunning orange in fall. It is a native to North America that grows well in full sun to partial shade. Two late summer perennials that bloom orange are the Butterfly Weed (Asclepias tuberosa) and the Big Sky Sundown Coneflower (Echinacea ‘Big Sky Sundown). As an added bonus, both attract butterflies and are low-maintenance. Butterfly Weed is a native plant with fragrant orange flat-topped flowers. Big Sky Sundown Coneflower has lightly scented orange daisy-like flowers with big brown eyes that bloom mid-summer to mid-fall. Both require full sun. Les Fougères in Chelsea, Quebec– site of the author’s retirement brunch. Looking for leaves of gold? Then consider paper birch (Betula papyrifera) with its stark white trunk and golden leaves. It is well suited to our zone 4, a mid-sized tree that prefers moist soil and full sun.The birch is a native North-American tree that prefers colder-climate regions. When stressed, the tree is vulnerable to bronze birch borer beetles, a problem in the Ottawa region. Another possibility is the maidenhair tree (Ginkgo biloba) with unique fan-shaped leaves that mellow to yellow in the fall.The ginkgo’s lineage can be traced back to the dinosaur age. Choose a male tree, as the female ginkgo has a foul-smelling fruit. Shrubs to consider include the Lemon Thread Falsecypress (Chamaecyparis pisifera ‘Lemon Thread’), a slow growing evergreen with lemon yellow foliage. Its threadlike leaves have a fine, delicate texture. Bud’s Yellow Dogwood (Cornus alba ‘Bud’s Yellow’) is a large spreading shrub with showy yellow branches and fall leaves. 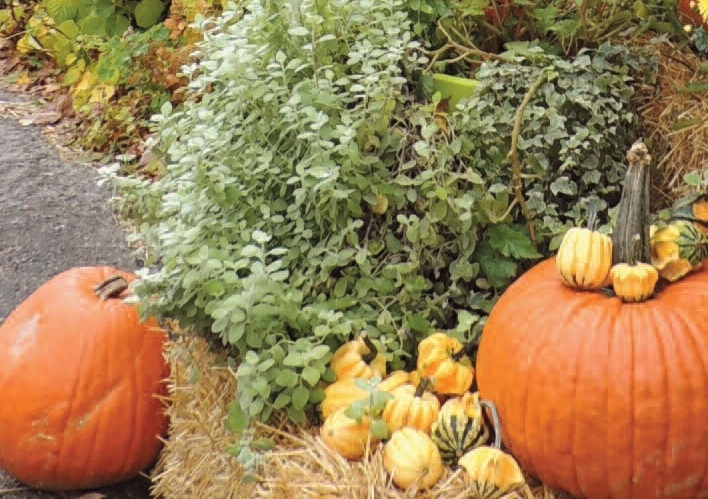 Julianne Labreche is a member of the Master Gardeners of Ottawa-Carleton and freelance writer. This entry was posted in Homestyle and tagged landscaping. Bookmark the permalink.